The Curtiss XBT2C was an experimental single-engined dive/torpedo bomber developed during World War II. It was based on the Curtiss XBTC single seat dive/torpedo bomber, but used a less powerful engine Wright R-3350 radial engine and could carry a second crew member in the rear fuselage. It was fitted with radar, which was carried in a pod under the starboard wing. 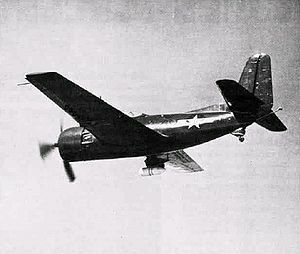 Nine of ten projected aircraft were built. They were Curtiss' last type for the U.S. Navy. All were scrapped in the late 1940s. Donald, David (1997). The Complete Encyclopedia of World Aircraft. NY, NY: Barnes & Noble. ISBN 0-7607-0592-5. Thomason, Tommy H. (2009). Strike from the Sea: U.S. Navy Attack Aircraft From Skyraider to Super Hornet 1948-Present. North Branch, MN: Specialty Press. ISBN 978-1-58007-132-1.